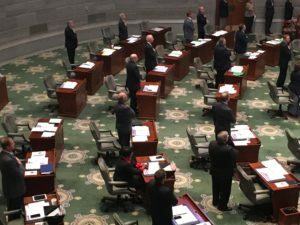 State senator Jamilah Nasheed (D-St. Louis) did not stand and say the Pledge of Allegiance Wednesday during the legislature’s annual veto session. In a statement from Nasheed, she says she’s showing support for San Francisco 49ers quarterback Colin Kaepernick, who sat down during the national anthem at recent games in protest of police brutality and social inequality. *The injustice of economic disparity. There was no commotion on the senate floor surrounding Nasheed’s actions. Lt. Governor Peter Kinder (R) issued a statement calling Nasheed’s demonstration an “occasion for great sorrow”.